Like many table games, Roulette has a long and worldly history. Primitive forms of the game were played as early as the 16th century, and it was about 100 years later that it was being enjoyed in its present form. The game was instantly popular in Europe; it seemed red, black, odd and even numbers transcended all languages and nearly all betting limits. Find out about the different online roulette games that can be played by visiting our roulette software review pages, where you can read about RTG, Microgaming, Playtech, Cryptologic, Net Entertainment, Party Gaming, Top Game and Live dealer roulette. To win at roulette, you have to learn how to play roulette; and to play roulette; you have to learn how and when to wager a bet. The premise of the game is simple, with the perimeter of a wheel containing odd and even numbers in alternating black and red pocket spins in one direction, while a ball is tossed onto the wheel in the opposite direction. The pocket the ball lands in-and its corresponding color or number is the winner. Seems easy enough on principle; however, add into account all 37 pockets (for European-style roulette) or all 38 pockets (for American-style roulette), as well as all the possible bets and outcomes the game creates, and suddenly the game becomes a little more complicated. Here at Games and Casino, we aim to demystify the game and help make you a more confident table player. We’re sure you know the difference between red and black, odd and even. But what about inside bets versus outside bets? Streets versus corners? Dozens versus columns? If you want to learn how to play roulette, you have to understand these terms and when it serves you to wager with them. 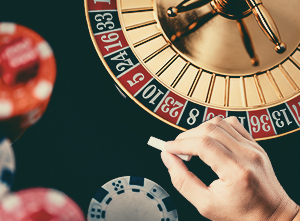 Whether your wager pays an odds of 37 to 1 or nearly 1 to 1, you can increase your chances of a big win at roulette, or several small wins, with the information we’ve gathered below. You’ll increase your gaming vocabulary as well as learn a few tips, working strategies, and all of the rules of the game. And you can do it without spending a dime, which is already a great return on your investment. For more information on roulette and other games, check out our FREE eBook. It breaks down individual game strategies, tips, and other great information. In the meantime, select from our list below to get started.